Given the speed with which new releases hit the market these days – we know we're not close to writing about all of them yet still tend to post between ten and 20 each week – it shouldn't be that surprising when uncommon ingredients crop up more than once. Yet it still amuses us when you spy a two or more brewers opting to add something to their beer that you wouldn't normally find in beer at pretty much the same time. Case in point here: Hunter Valley wine juice making it into three beers within a month of each other. 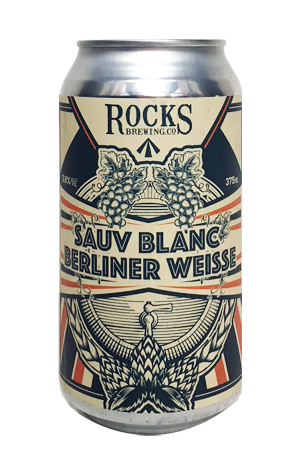 Admittedly, with Hope Brewhouse's two harvest IIPAs the weapons of choice were semillon and chardonnay, whereas Rocks has gone for sauv blanc. And the base beers to which the juices have been added couldn't be much further removed, with the Sydney brewery popping theirs inside a Berliner weisse. The result is as quirky as you might expect: at first, aromas are reminiscent of a bready, lightly fruity slice of cake, at least until the grape juice takes over: sweetly tropical and a little herbaceous. The souring bacteria throw up hints of toasted coconut and oak, even though no barrels were used as far as we're aware. On the palate, it's rather more linear: wine juice up front, a sour tang as backup.